Race News….updates…pics…snippets of info as it happens! 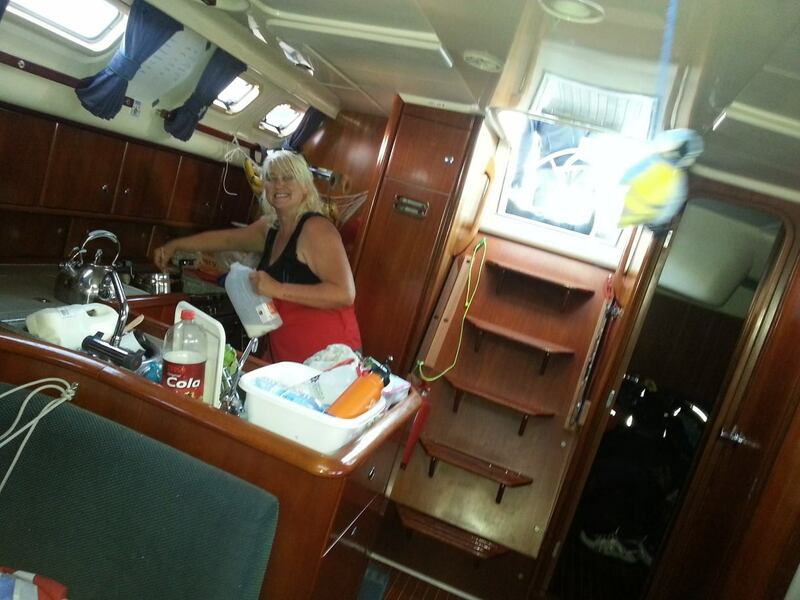 1530utc: A couple of hours ago a friend of Jerry’s referred to Jubilant as a “floating condominium” to which I replied “Jubilant IS the skippers home….. its meant to be like a floating condominium (although pics before the “racing profile” did look rather more glamorous)!! 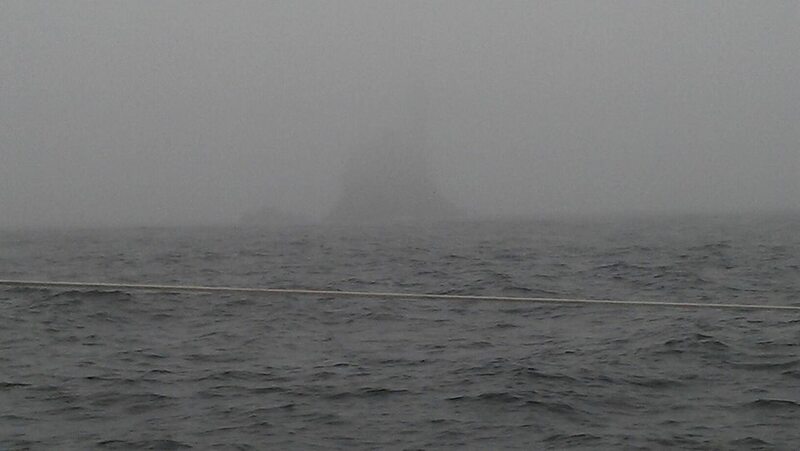 … hmmmm I wonder how many homes have raced around the Fastnet Rock??! !” and that really does beg another question. 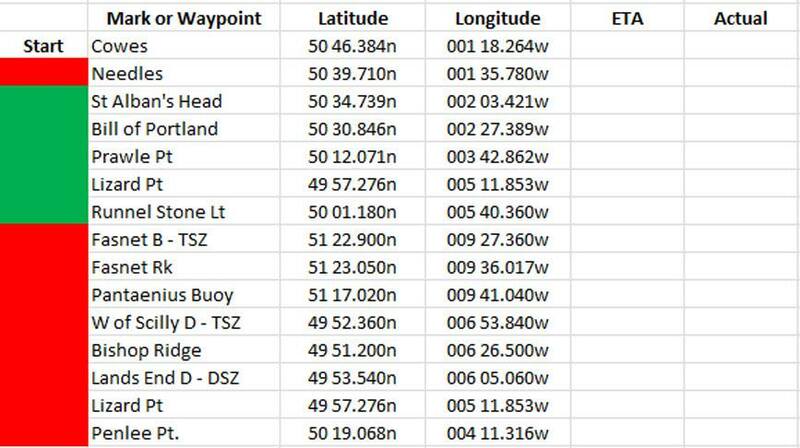 How many homes have raced and finished the Fastnet Race. As this is clearly a question that is crying out for an answer, it has been posed on RORC’s Facebook page! I will let you know if there is any reply! Nice One!! We beat ICAP Leopard and Monster Project, Maxi 100 and Open 70 respectively! 1015utc: This is it….. THE FINISH LINE is close …. 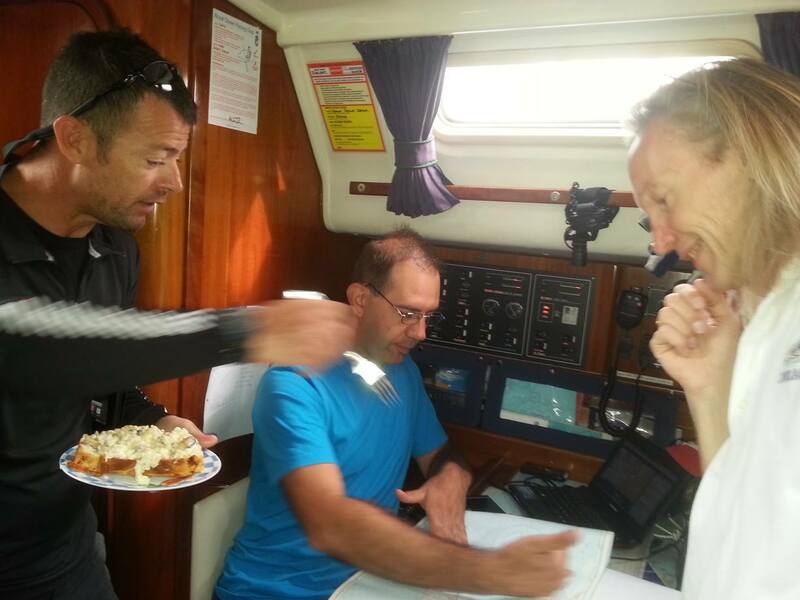 1110utc: Team Photo – safe and sound in Plymouth! 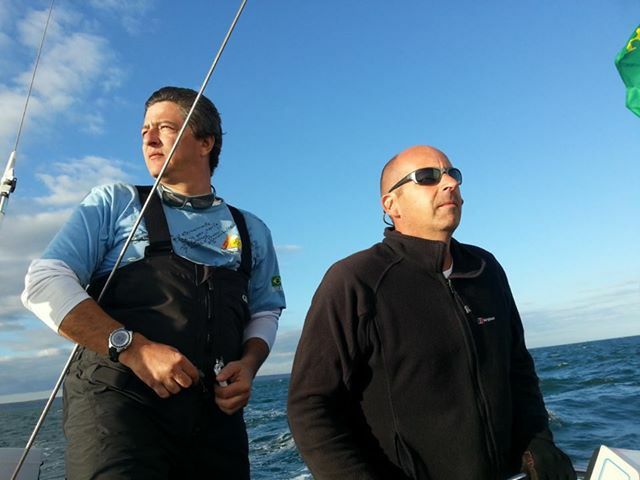 SOLers Gilles and BER_Baggus coolly finishing the Fastnet! 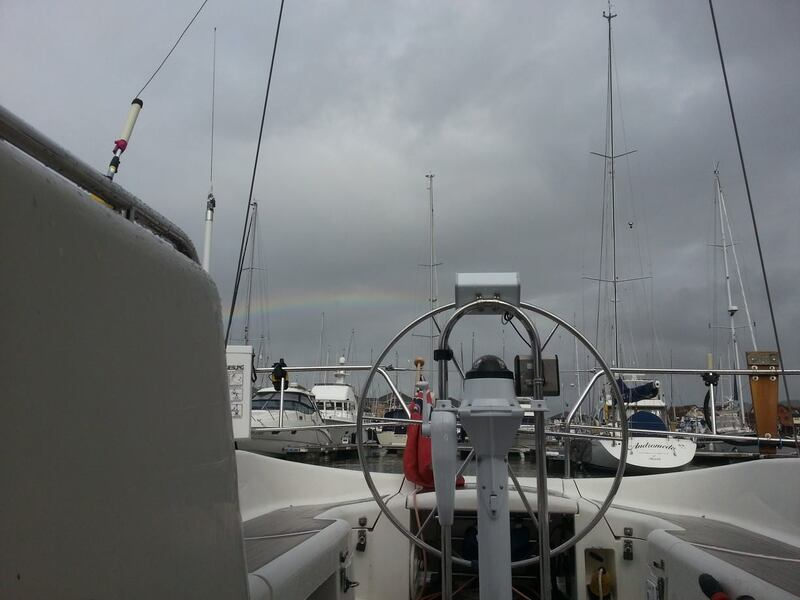 0900utc: 7nm out and Jubilant is happily heading for Plymouth and hot showers and fresh clothes at Sutton Harbour Marina, where Sophie keeps her yacht, Florence. 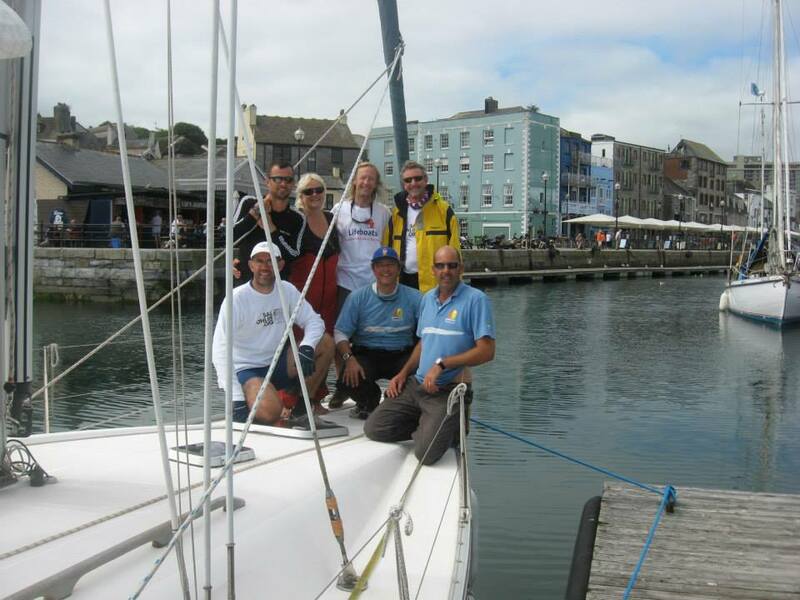 The Marina manager has confirmed that the fabulous new Jubilant Fastnet Campaign tees have been delivered so watch this space for (hopefully) some team pics! we stink like dead badgers! 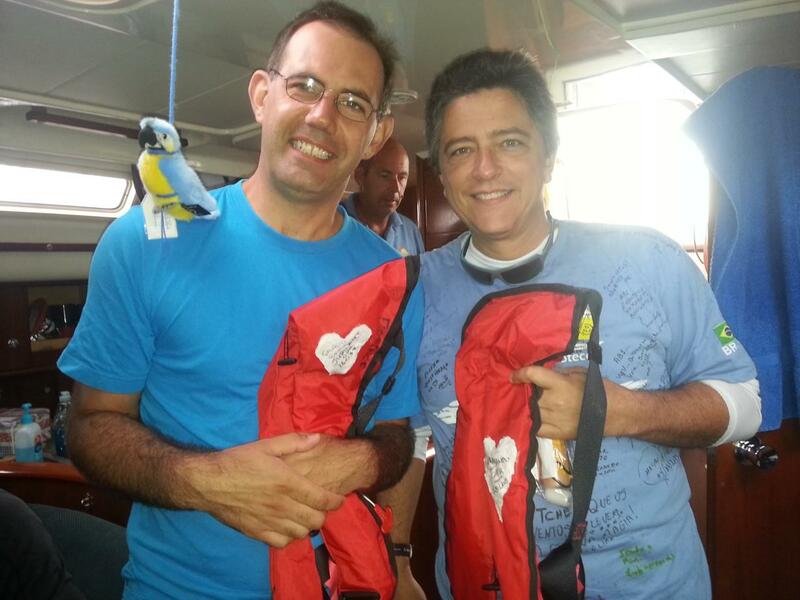 0750utc: AHOY Jubilant! The finish is in sight with approx. 12nm to go. Perfect timing and excellent performance. 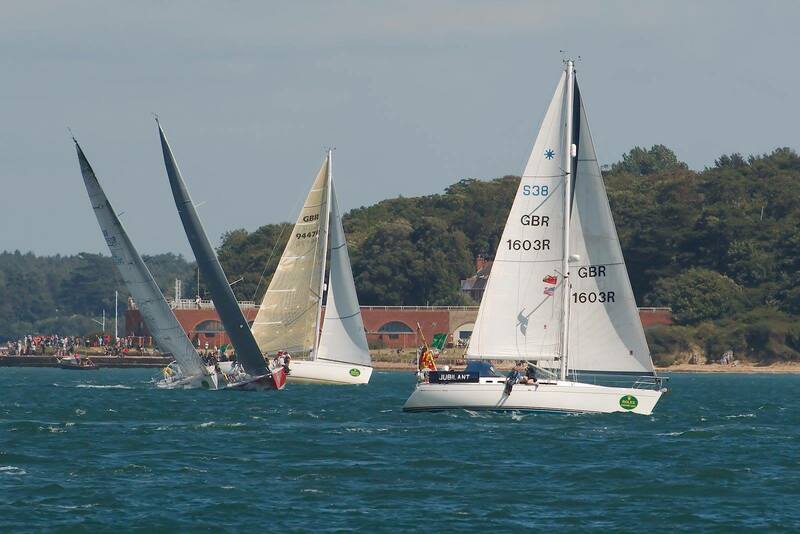 Of your original peer group, Emily retired, Nokomis has finished but you are now ahead of Baloo, Ocean Tango and Jolie Brise. Just wonderful guys, THANK YOU!! SOLers are all super-proud of you. 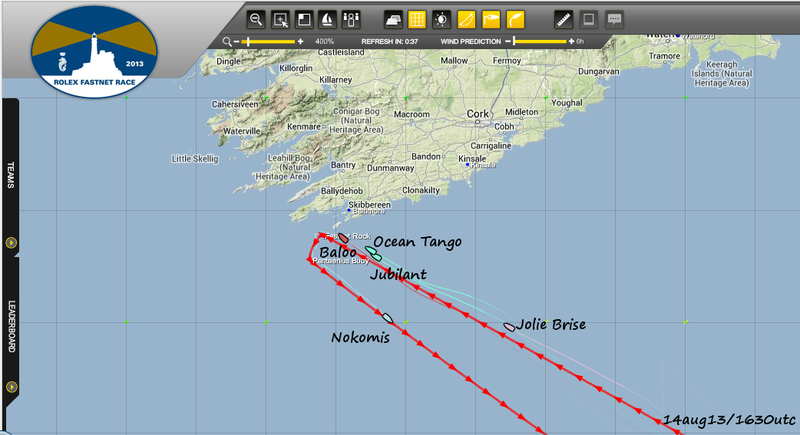 2230utc: Latest, possibly last, AIS and Tracker screengrabs because.. in a very few hours Jubilant is due in Plymouth and our fabulous SOLers will have completed their first Fastnet Race – HURRAY for Armando, Gilberto, Jerry, Martin, Nigel, Sophie and Tony (in alphabetical and no other priority-order!!). 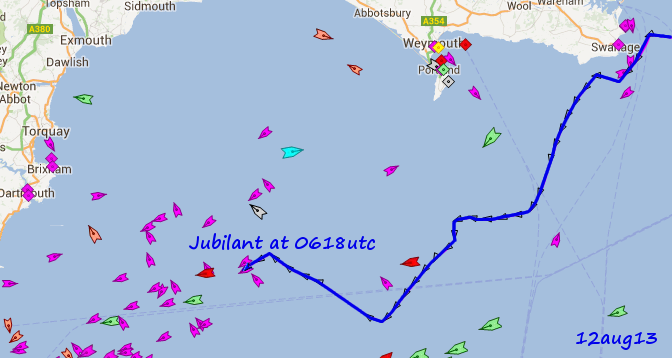 1837utc: YEEEEEEEEHAAAAAAAAAAAAA Jubilant is back on AIS!! 1720utc: No messages from Jubilant but her track speaks volumes – making excellent progress as this picture of her with her “peer group” reveals. 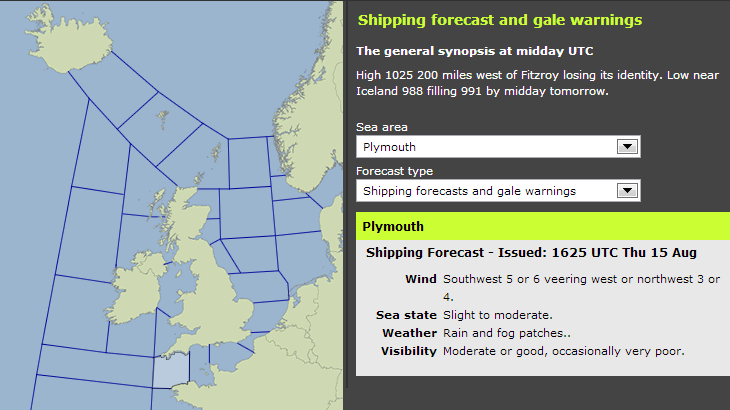 The MetOffice forecast is self-explanatory! 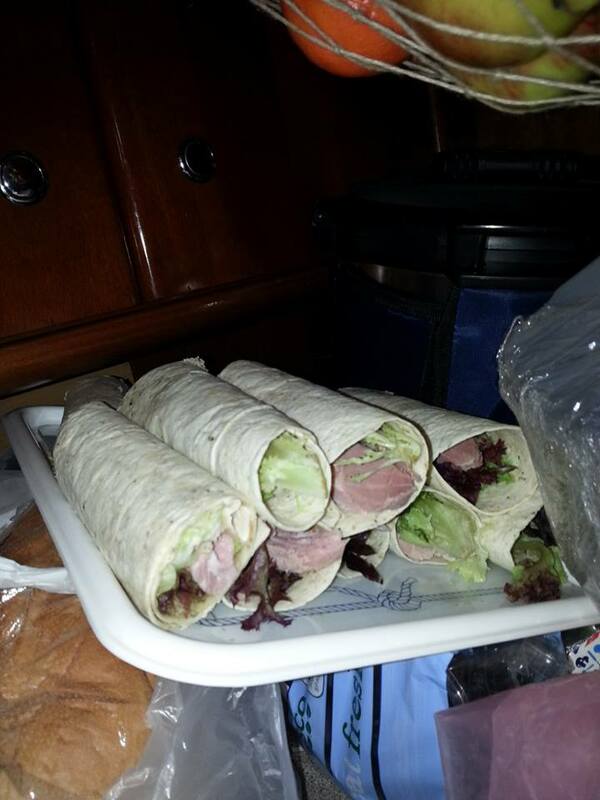 0730utc: Having sent us some excellent pics of Jubilant’s observation of Formal Dress Code for the rounding of the Fastnet Rock, we have to assume that the Fastnet Banquet and the broaching of the Wild Days Rum were completed according to plan! 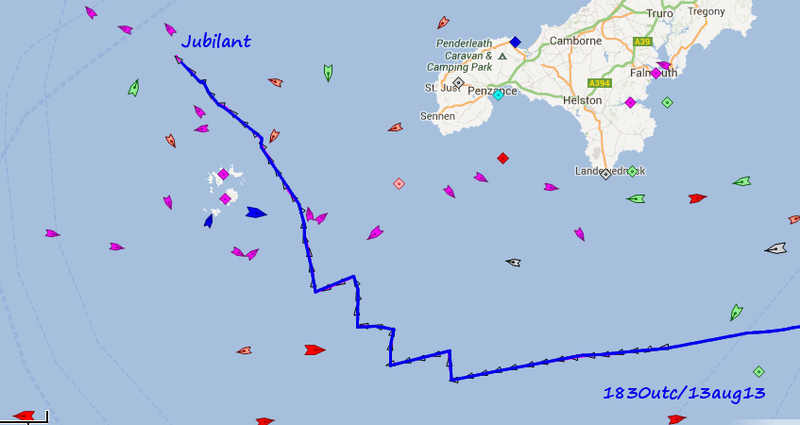 Jubilant is now well past the Pantaenius Buoy and her course to the finish in Plymouth is past the Isles of Scilly – leaving every island and rocklet to port. 1930utc: and the pics we’ve all being waiting for! NOTE the Fastnet Formal dress code – from pretty frock (Sophie of course) to bowties and dress shirts!!! Love it! Sophie – at The Rock! 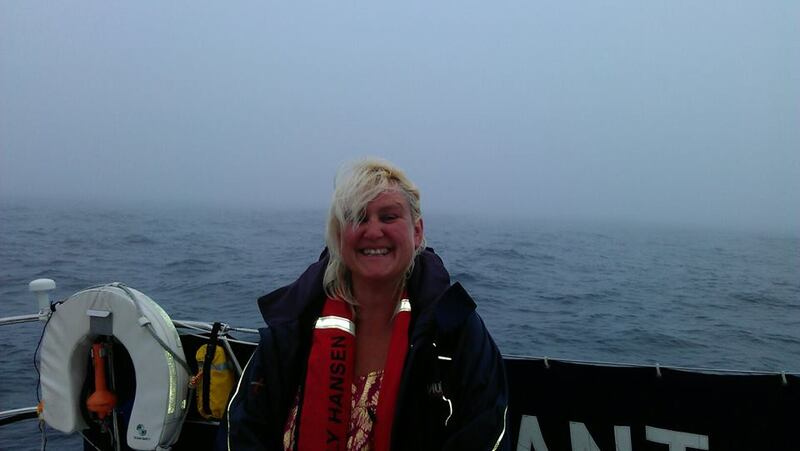 1830utc: By jove she’s done it!!! She’s got to The Rock… BRAVOOOOOOOOOOO JUBILANT!!! Three cheers for our indomitable SOLers! HIP HIP…… HURRAY!!! HIP HIP…… HURRAY!! !HIP HIP…… HURRAY!!! 1630utc: AIS isn’t picking up signals from the boats off Ireland but the Yellowbrick race tracker is keeping tabs (updating every half an hour) and the latest image has Jubilant closing on The Rock with the first of the peer group, Nokomis, already rounded. At this point, I suspect the precious bottle of Wild Days Rum from New Zealand will be un-stowed as it was planned that the tiniest of tots will be served to toast a successful rounding! GO JUBILANT! 0600utc: Jubilant continues to make good progress towards Fastnet, in company with the three other remaining members of her “peer group”. 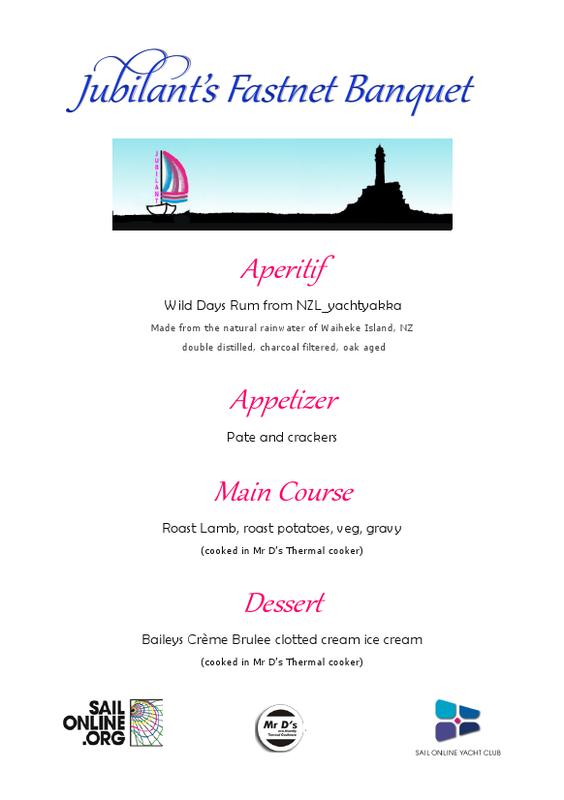 If you look at the planned Menusyou’ll see that tonight’s dinner was pre-planned to be the Fastnet Banquet and it rather looks as it this might actually take place as scheduled!! 1830utc: Jubilant continues to make steady progress. What a tanker “drive by” looks like! 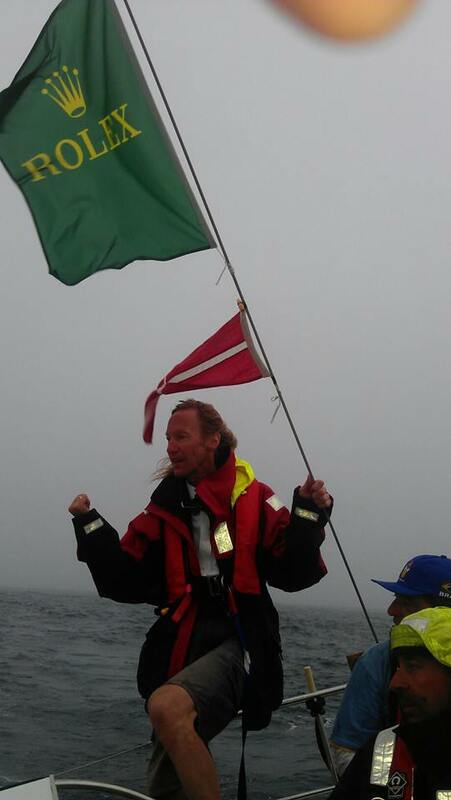 2000utc: Kroppyer has very kindly provided another duo-pic of Jubilant (on AIS) with the fleet on Sailonline. Bravo! 1845utc: Just found that SOLer kroppyer has very cleverly managed to blend the SOL fleet in the August Two-step race with the AIS image of Jubilant! I was only musing to myself the other day that this would be perfect – dank je wel, kroppyer! 1602utc: Official RORC Video of Race Start – helo footage and commentary! 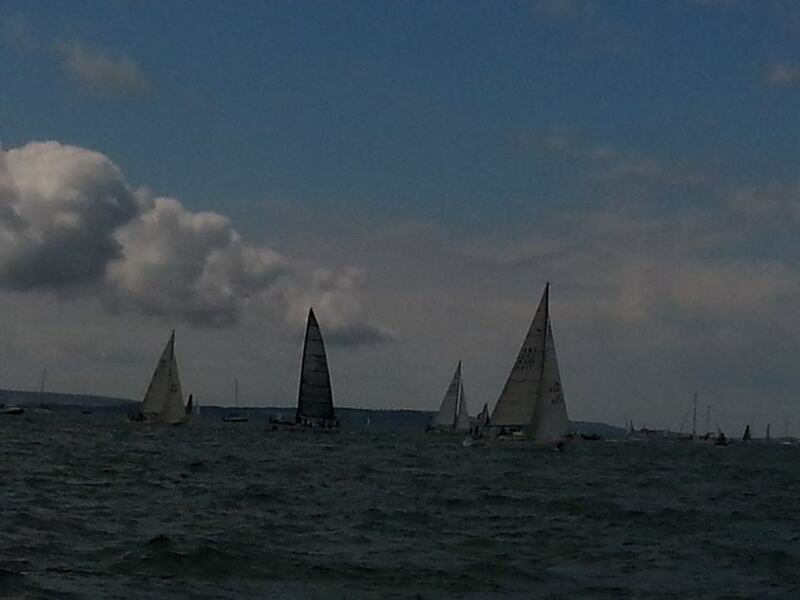 Jubilant is currently mixing it up with ICAP Leopard in IRC Overall! 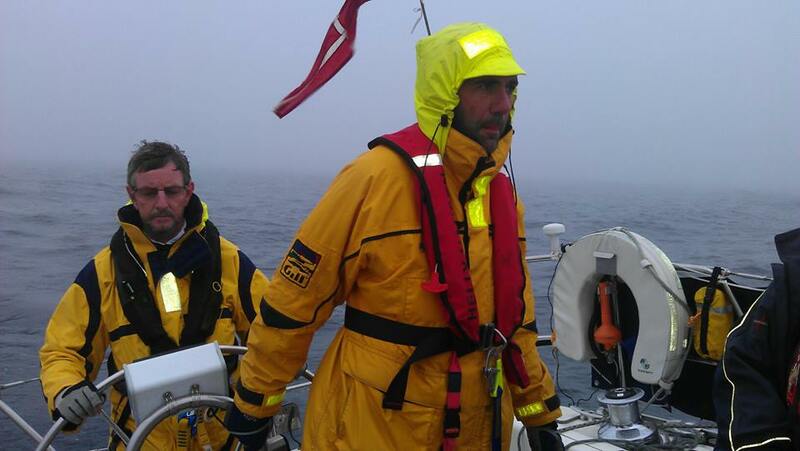 We are now south of Dartmouth but ghosting along looking for wind (and fighting an eastbound tide in 66 metres of water depth).Spirits are good and we are eating well. Thermal cookers being dutifully employed.Nigel,Gilberto and Armando currently on watch with Sophie, Martin, Gerry and Tony resting. 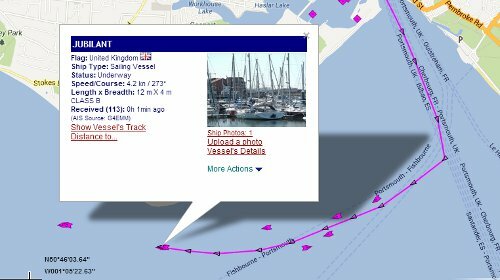 0908utc: Yesterday SOLer 76Trombones listed 5 other boats that will perform similarly to Jubilant (on the basis of handicapping) – four of them are visible in the Tracker so… here is Jubilant’s Group as at now. 0638utc: No news in overnight from Jubilant but this is to be expected – mid-English Channel the only comms that would work are the satphone and the ship’s radio, neither of which are to be used for texts or Facebook messages. Once the crew are closer to shore, I have no doubt that they will be in touch. 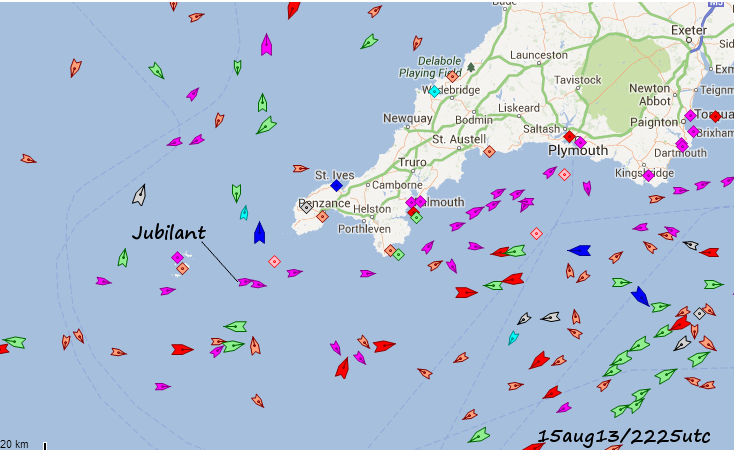 A quick look at AIS shows that Jubilant’s choice of routing would have kept her clear of the bulk of the fleet – so no inadvertent overnight encounters! – and this morning, while she is towards the back of the IRC fleet, her “nemesis”, Jolie Brise, is lying 80th in IRC 4 and 287th in IRC Overall (if you want to know why “nemesis) read my post of 1255utc yesterday!). 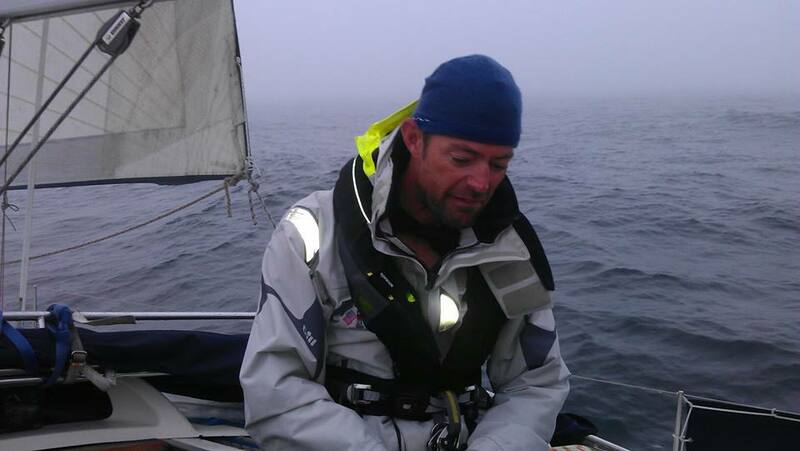 Jubilant is lying 76th in IRC 4 and 282nd in IRC Overall. 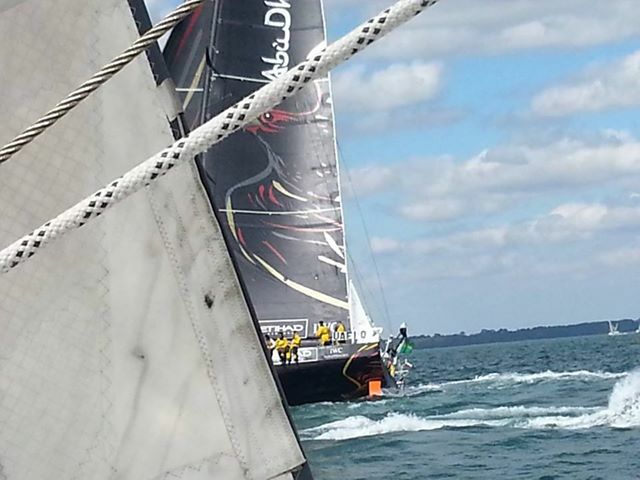 11 August 2013 – RACE DAY! 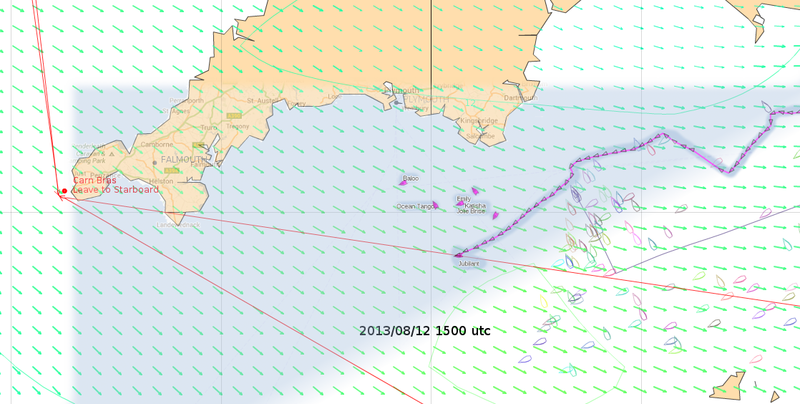 2120utc: The latest plot on AIS shows Jubilant happily in mid-Channel – offering more elbow-room for overnight. This is what I am using to keep track of Jubilant’s progress. The boat is roughly 45 minutes behind their planned route as they pass St Alban’s. They are on course and on speed for their actual position in the route. 1830utc: Two brilliant actions shots of Jubilant taken by Jono Robertson and posted to the FB page. 1609utc: Three excellent pics from Jerry – the stuff of dreams really! 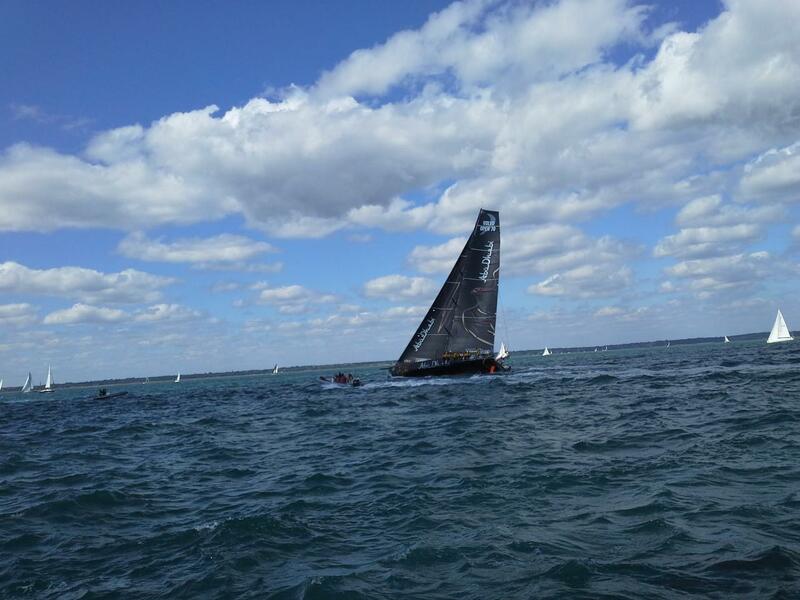 1519utc: Just found a Livestream link to video of the start of the race.. looks excellent! 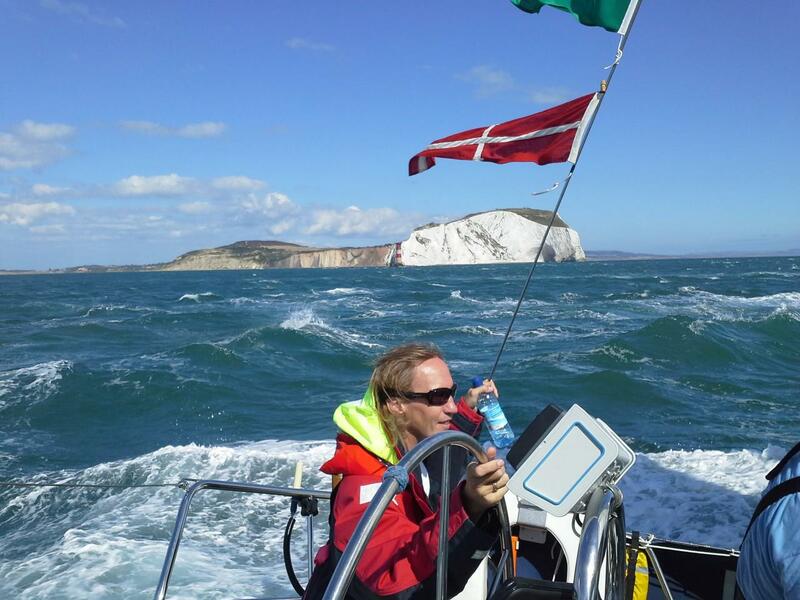 Currently on starboard tack..approx 18 knots of wind on the nose and the needles are three miles behind us… safely out of the Solent. 1340utc: A couple of video links – these were posted into Facebook by Sophie (but public) so hopefully the links will work. If not then I will try and figure out a way to get em viewable! VID – everything is leaning! 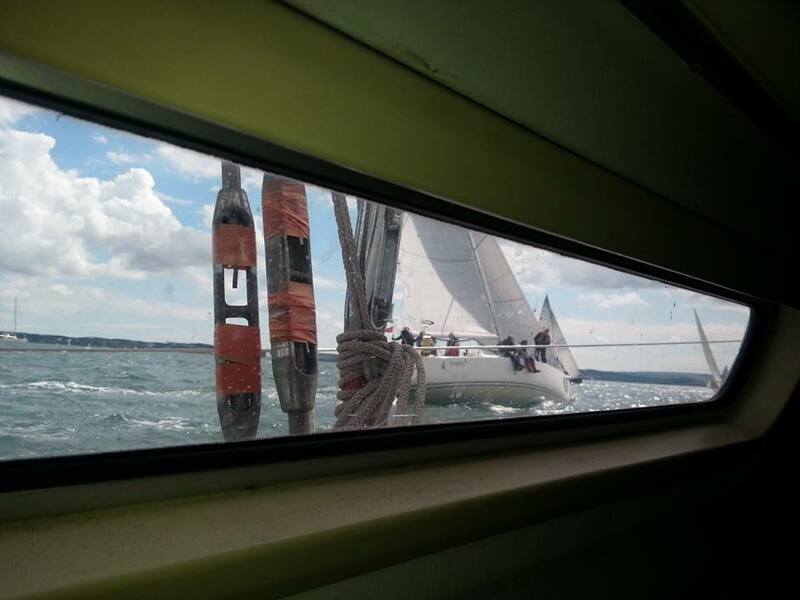 1255utc: Jolie Brise seen from Jubilant. 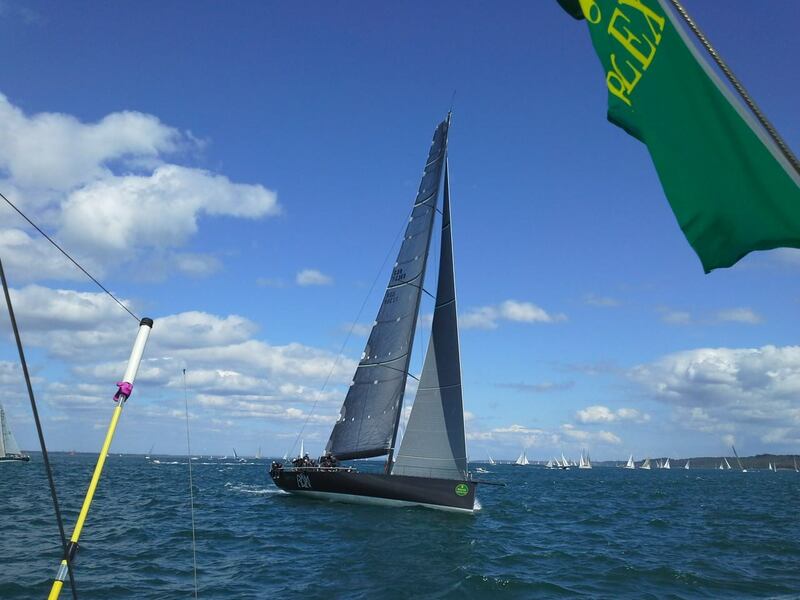 According to SOL’s Polar Guru 76T (Matthias), Jolie Brise is closest competition to Jubilant on handicap. 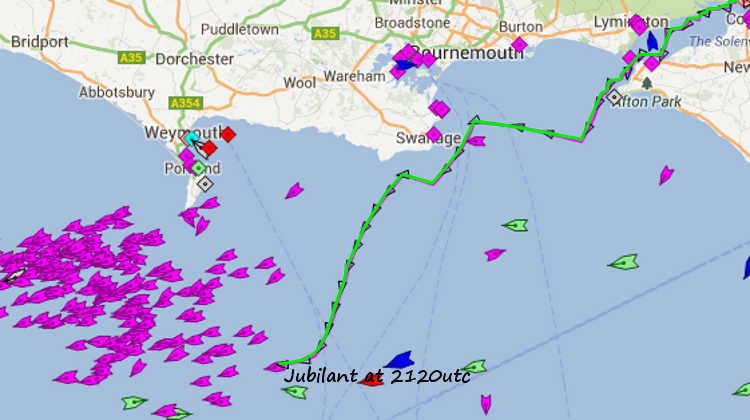 1212utc: No-one can say Jubilant isn’t working hard to get going! 1253utc: Do you think it might rain soon??!! Sky over Jubilant a few moments ago!! 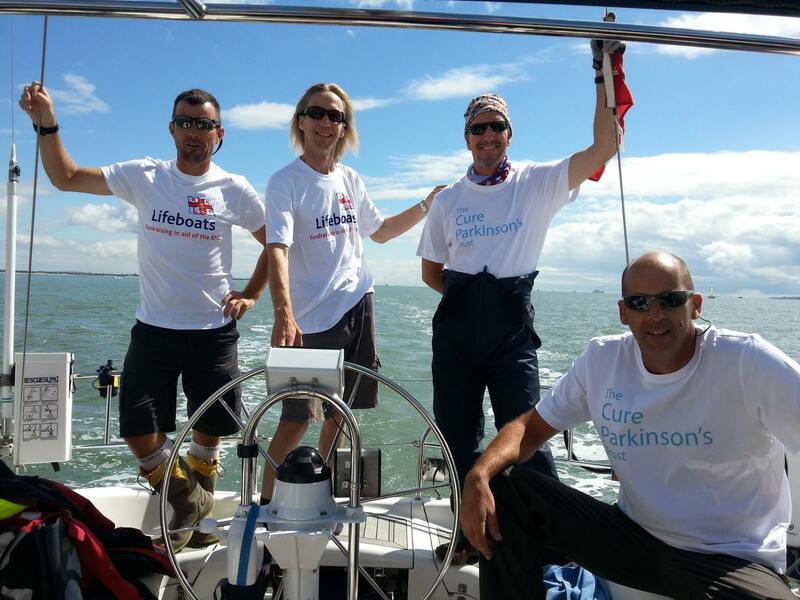 1045utc: Crew ready for the start wearing RNLI and The Cure Parkinson’s Trust Tees!! SHOUT-OUT on Fastnet Radio pretty much verbatim of an email sent to them. 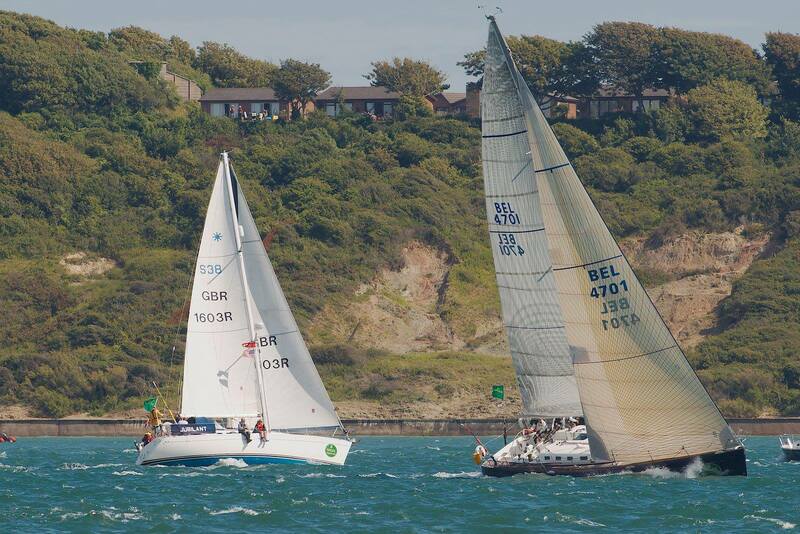 Please would you give a shout-out to Yacht Jubilant (sail # GBR 1603) competing in this year’s Fastnet Race. 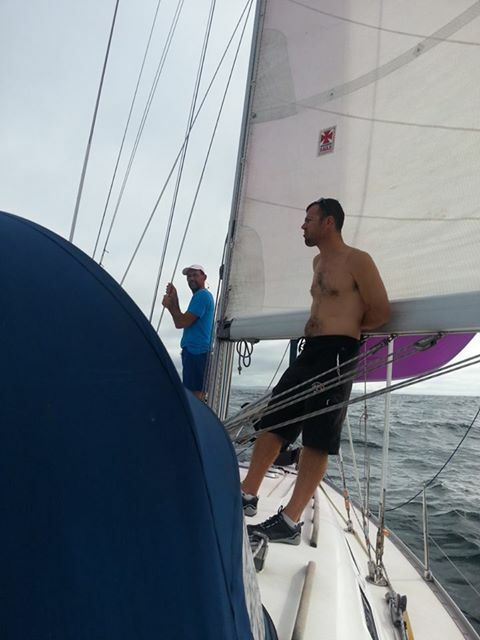 the crew is made up of sailors from across the globe who only met up while sailing on the virtual navsim at http://www.sailonline.org! 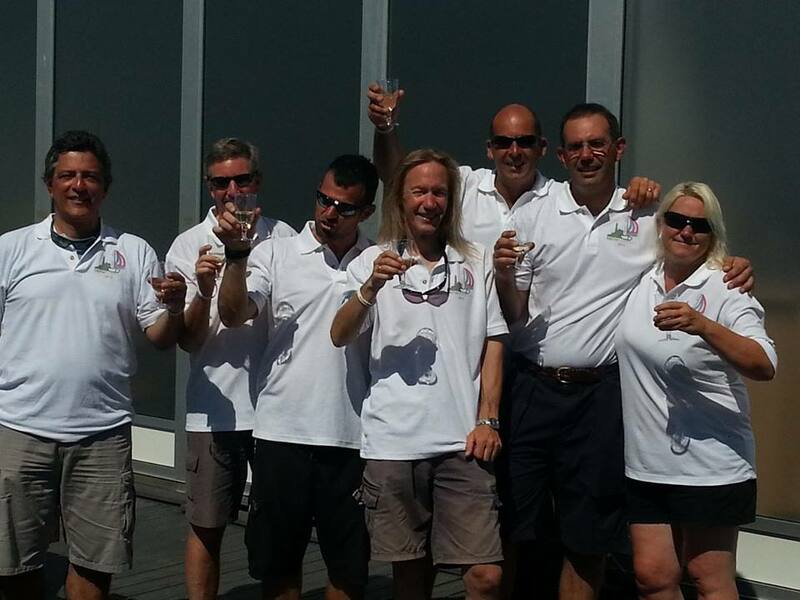 The skipper, Martin, Sophie, and Nigel are Brits – Tony has flown in from the USA, Armando has flown in from Brazil, Jerry has flown in from Bermuda and Gil who is Italian has flown in from Germany!!! 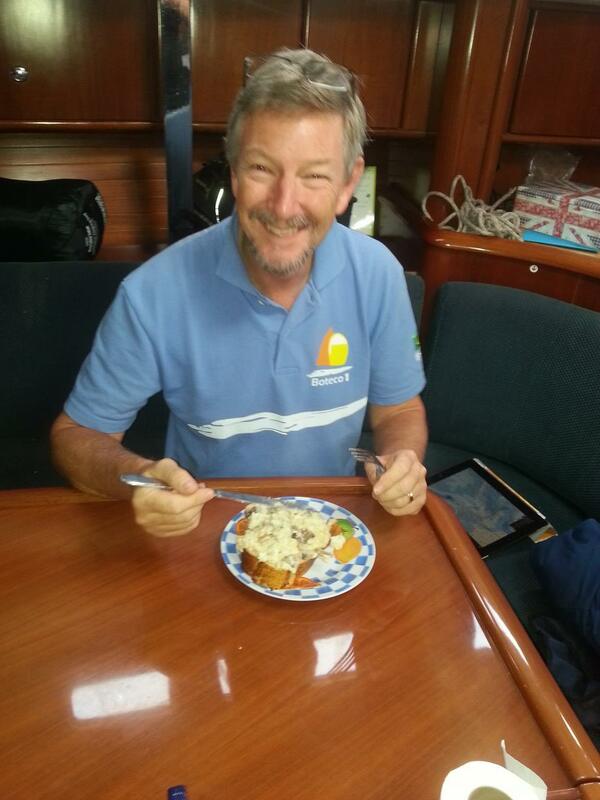 A clarification email that it is the first FASTNET race for the crew has gone. a fairly heavy rain shower came through, this decreased the winds, however the sun will be coming through and this will increase the wind coming through so it will be 10kts shorty… the wind is out of the west so plenty of beating to get out of w solent .. this westerly will remain but will veer towards the nw and stay nw. 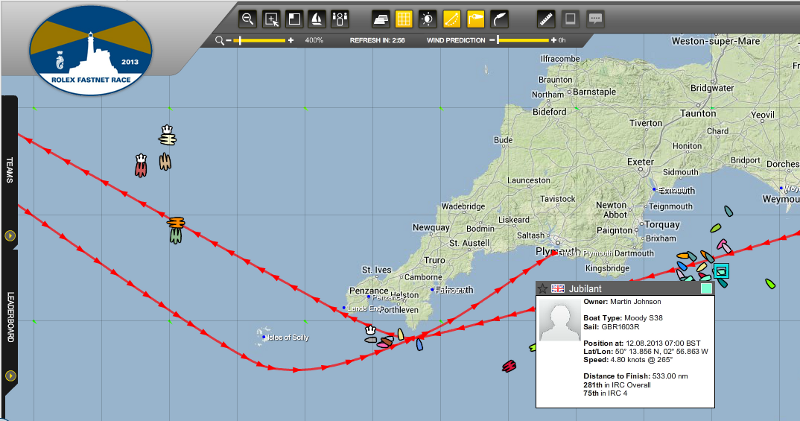 A fast beat home for the quicker boats, but as winds back towards sw it will give the slower boats a good race back to Plymouth. 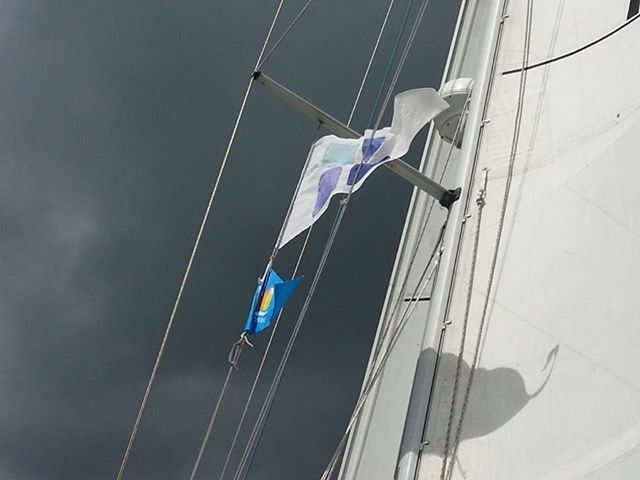 Jubilant proudly flying the SYC flag!! It is mandatory for all competing yachts to pass through an identity gate on the morning of the race. 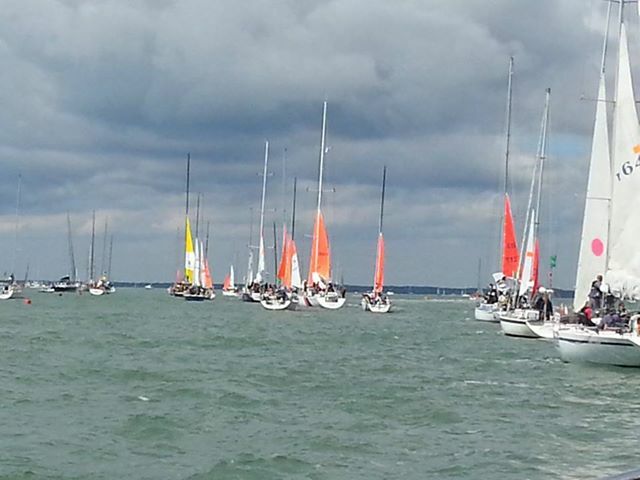 These are narrow gates, marked in the water by imaginary lines between small buoys and RORC race committee boats. There will be two identity gates, one just off Cowes seafront and one towards the southern end of Southampton water. We will choose which to pass through on the morning of the race depending on weather conditions. 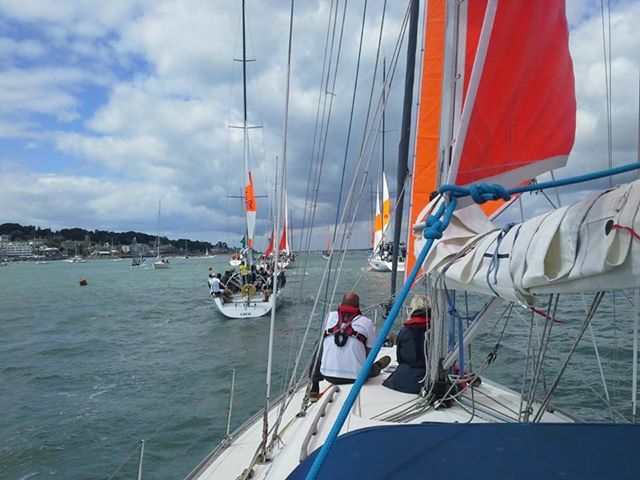 As we pass through the gate we have to declare the number of persons aboard for the race and also display (in their set positions) our storm jib and try-sail. These are the bright orange heavy weather sails that we could use in storm conditions to save wear on the rather large and expensive white sails. 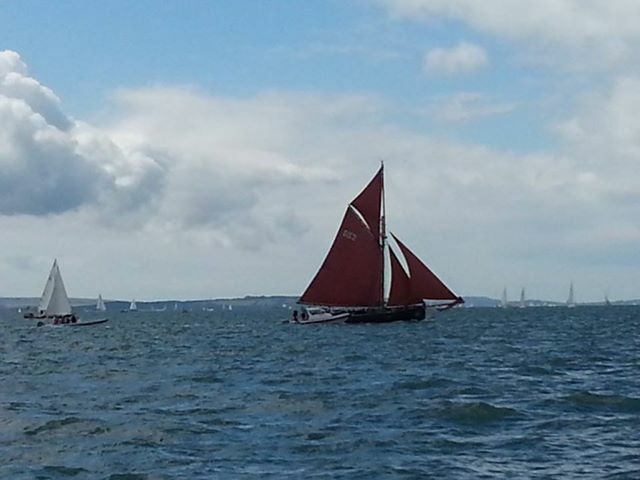 The photo shows our orange storm sails being covertly tested a couple of weeks ago just off Southsea seafront. 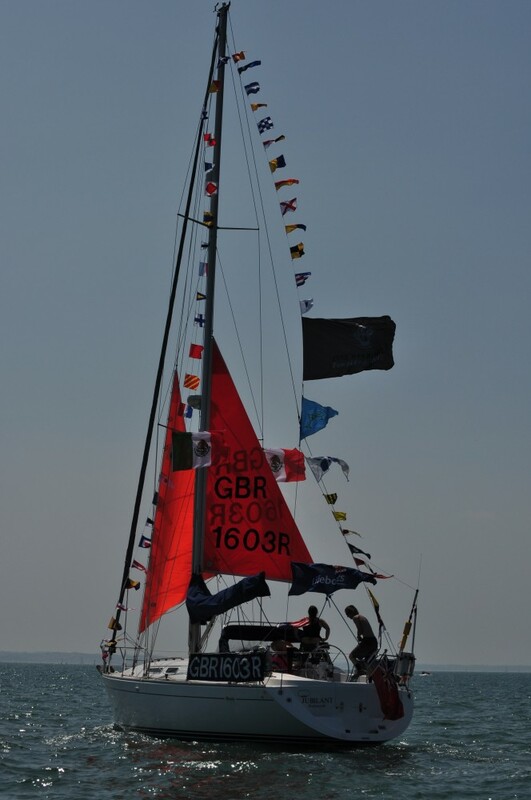 Although rain clearing and its getting brighter…coffee was great and well be getting storm sails hoisted as we approach Cowes.. 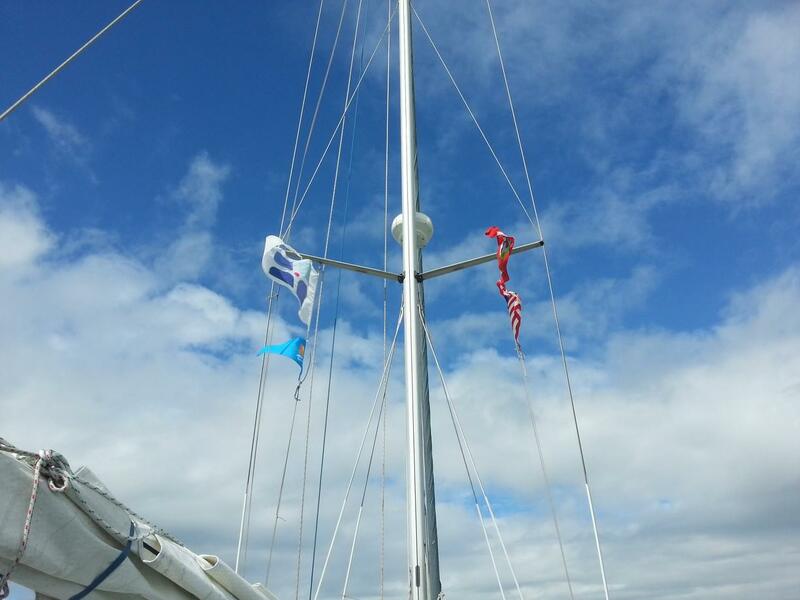 Currently cloudy conditions and a little damp, 10-12kts w/sw forecast, low water was at 0749. Cloud is due to clear and conditions to lift before race start. Welcome to the sunny south coast of England! 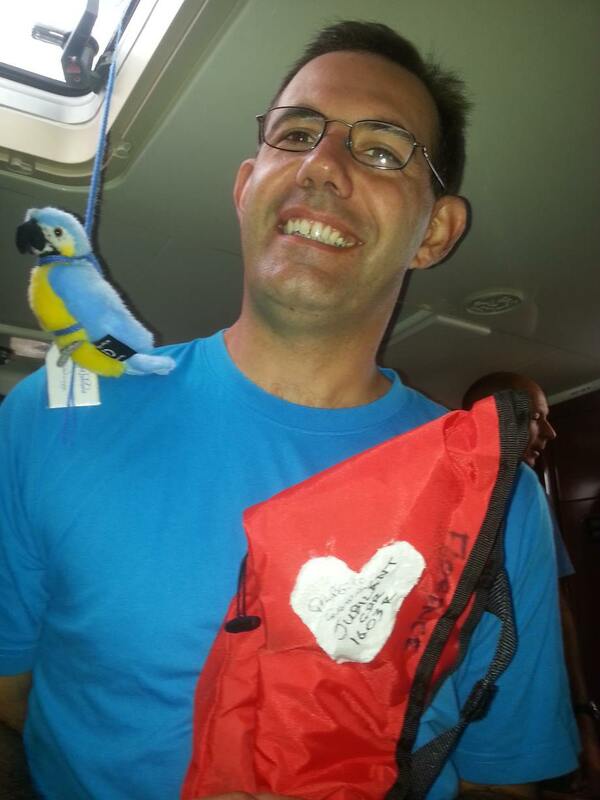 Gilles and RC, the Ship’s Parrot, become acquainted! A typically understated British welcome for Armando from Sophie and Nigel!! 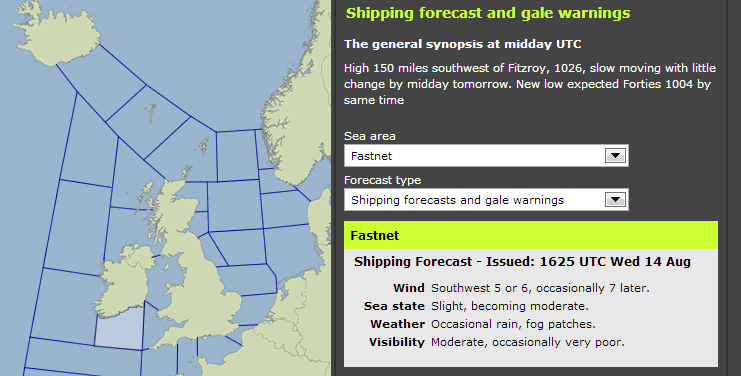 0755utc: remember you can listen to Radio Fastnet online – the link to it along with links to other tracking info is here: http://fastnet.rorc.org/ (87.9fm in Plymouth or 87.7fm in Cowes). The broadcast will be live from 1000utc. 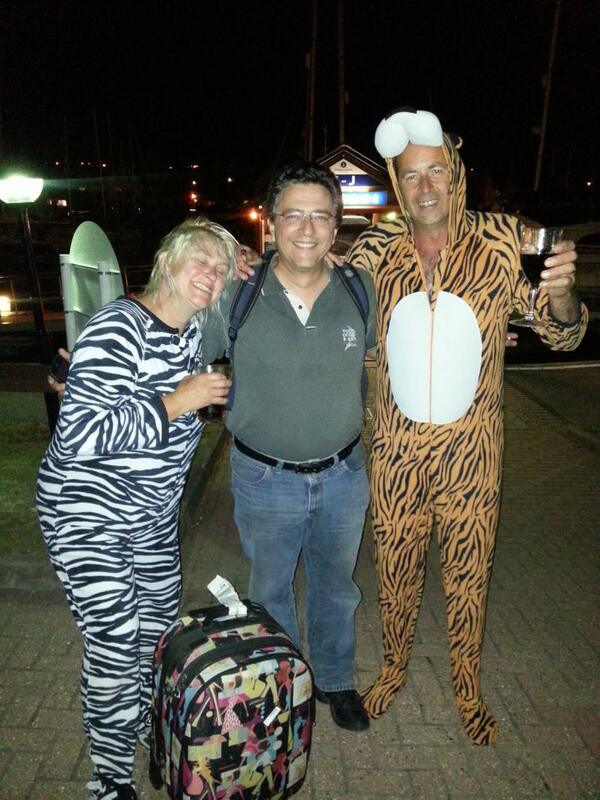 0750utc: brief exchange of texts with Jubilant – soon to be leaving her mooring at Port Solent. 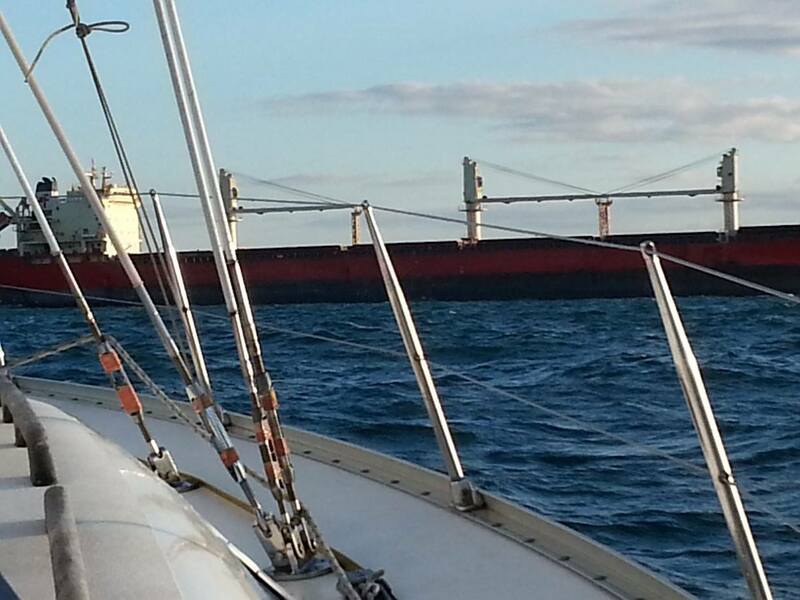 Will follow You on AIS. Congrats to All involved. Hope You enjoyed it.